A faction of Klingons wants to talk peace (yeah, that’s not suspicious at all). To that end, the Federation dispatches Ambassador Sarek, but his shuttle is sabotaged en route — not by Klingons, but by radical elements within Vulcan society. Burnham senses his distress through their katric bond, and it falls to her and the Discovery crew to save Sarek before it’s too late. This is essentially a filler episode in that it does very little to advance Discovery‘s arc, but it doesn’t feel like a waste of time. The main thrust of “Lethe” is to flesh out Burnham’s past, and it does so well. 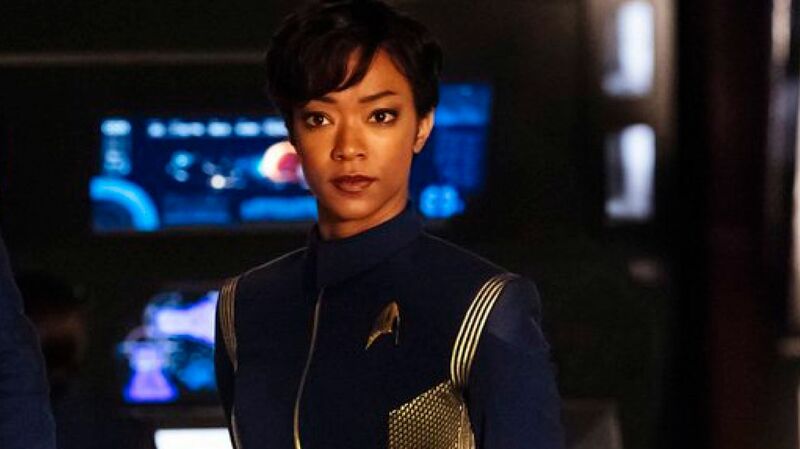 Learning more about the trials of her Vulcan upbringing somewhat ironically helps humanize her a lot, and despite my initial dislike of the character, she’s growing on me more and more. James Frain also puts on a solid performance as Sarek. I feel a little bad for him because Mark Lenard was so fantastic as Sarek, and that is an incredibly tough act to follow. I don’t think Mr. Frain has quite equaled his predecessor in the role, but he’s doing a very admirable job of trying. I also appreciate that while the focus is once again on Burnham, there is a decent amount of attention given to the rest of the cast, as well. Nearly everyone is given at least one good scene, with the possible exception of Saru. Another thing I liked is that I think “Lethe” is another example of Discovery following in the footsteps of Enterprise, something it’s done far more of than I ever would have thought possible. These are definitely the flawed Enterprise Vulcans much more so than the pristine Vulcans of earlier shows. I can easily see the current extremists being ideological descendants of V’Las and his Romulan-backed hardliners. Also, the biological bomb the extremist injected himself with is very reminiscent of those used by the Delphic religious fanatics seen in season three’s “Chosen Realm.” I don’t know if that’s deliberate or not, but my mind went to it immediately. So maybe “Lethe” isn’t a super important episode, but it’s very well done, and I enjoyed almost all of it. The one complaint that really stands out is that, in stark contrast to Discovery’s normally excellent visuals, the nebula looked like masticated Froot Loops viewed through crappy 3D goggles. Not sure how that happened. Well, that and I still hate what they’ve done with the Klingons. Liked this one too, though I had a bit of trouble believing that the previously intelligent (seeming?) Admiral Cornwell would so easily fall for such an obvious ruse. I just chalk that up to standard Starfleet naivete. Trying to see the good in everyone and all that.